I have never done yoga, where should I start? It can be intimidating to figure out the best way to start yoga. Each of us comes from a different place with unique backgrounds in fitness, injuries, and overall health, so this is a tough question to answer in a general manner. At Balance we offer several options for beginning students, and we encourage you to explore and find the right teachers and style of yoga for you. Intro to Yoga Series is a “yoga course” in which you commit to a number of classes over a certain period of time, typically four to six weeks. You will start with a group of beginning students and progress each week together. The teacher builds upon the previous week’s lessons and students are encouraged to practice on their own in-between group classes. We offer several styles of intro courses, ranging from more dynamic classes to those focused on relaxation. Please check the Events page on our website for dates and times or email us for more information. Intro to Ashtanga Primary Series – you will be taught the foundational elements of the Ashtanga practice including breathing and basic postures. The Ashtanga vinyasa system is based on the teachings of Sri K. Pattabhi Jois from Mysore India. This style of yoga emphasizes a dynamic practice which progressively opens the body allowing for a deepening self awareness and a true sense of calm. Intro to Ashtanga is a less challenging class than Beginners Ashtanga. Intro to Yoga – Emphasis on Stress Relief, Relaxation and Working with Injuries – emphasizes learning yoga in a non-competitive, non-judgemental environment and especially working with the tools from yoga which encourage releasing stress, relaxation and gentle yoga postures for all types of bodies. Perfect for anyone who feels like they are too stiff, injured or has reservations about starting a yoga practice, for this we also work with the Perth Chiro Centre to make sure the yoga movements you perform won’t harm you . We also offer ongoing weekly classes, that are not structured as series. These are typically a little different each week, and will vary based on the style of the instructors. Check out our YouTube Channel for an introduction to our instructors. Beginners Ashtanga (Thursdays 6pm) – You will be guided through the sun salutations and the standing postures of the Ashtanga Series. Each week different postures of the seated sequence will be explored, followed by a relaxing finishing series. This class gives you a firm foundation in the Ashtanga Series. This is a challenging class and does not include detailed explanation of postures. Community Classes (many – see online schedule)- Balance offers a variety of community classes that reflect individual teacher’s trainings and are always donation based. Instruction generally emphasizes alignment, full breath, and doing the poses attentively, deeply and non-aggressively. These classes are great for those new to yoga. Align and Refine – Level 1 Class (Saturdays 10:45am) – This yoga style seeks to bring the practitioner into a more harmonious state of being. A philosophical theme is woven throughout each class along with skillful and concise alignment instructions. In Level 1 the basics of common standing poses, seated poses, hip openers, and backbends are regularly practiced. These classes are suitable for those new to yoga or those who wish to build a solid alignment-based practice from the ground up. Hatha Yoga (Mondays 9am) – Get centered with this practice designed to create mobility in your spine, hips,shoulders and breath. Focus on spinal movement and standing postures with the intention of finding alignment and ease in the body. Appropriate for beginners to more advanced practitioners. Modifications available for injuries. Restorative (Tuesdays 7:30pm, Fridays 5:45pm) – Students use yoga props such as blankets, bolsters, blocks and straps to facilitate holding of poses for long periods of time. Restorative Yoga allows the practitioner to reach a deep state of relaxation by stimulating the parasympathetic nervous system. This helps to lower the heart rate, blood pressure and stimulate the immune system. By letting go of muscular tension with the support of props, the body is given a chance to rest deeply, allowing chronic stress to dissipate and healing to occur. This practice is a quiet and internal, allowing the practitioner to relax and release in both mind and body. Unwind (Thursdays 7:30pm) -Soothe your body and mind and nurture yourself in this class that combines breath awareness with gentle mindful movement to create freedom in the body, calmness in the mind and and reduced stress on the nervous system. Accessible to practitioners of all levels, including beginners. Each session finishes with a restorative posture or two to deepen relaxation. 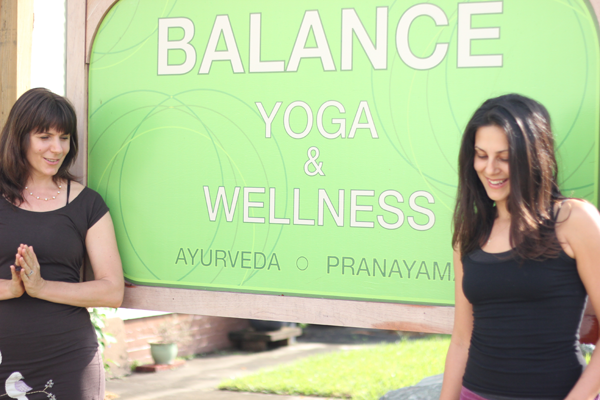 For introductions to our teachers and other instructional videos, check out Balance Yoga’s YouTube Channel. If you would like to talk to someone about yoga, you can call us at 504.309.9618 or email info@balanceyogawellness.com.